Jim Jarmusch’s “Paterson” begins with an overhead shot of the titular character (Adam Driver) and his wife Laura (Golshifteh Farahani) asleep in bed. Paterson wakes, looks at his watch and climbs out of bed to begin his routine, and as he comes up from his slumber, it is almost as if we, the audience, go under, vanishing into a waking dream. Jarmusch has always made movies that feel like dreams, whether it was the hallucinatory frontier journey of “Dead Man” or the nocturnal vampire romance of “Only Lovers Left Alive”, but “Paterson” builds its unassuming fantasy out of the most unlikely ingredient – the everyday. In cinema, the everyday is often something to be feared or escaped from, an allegorical death sentence just weighing you down. 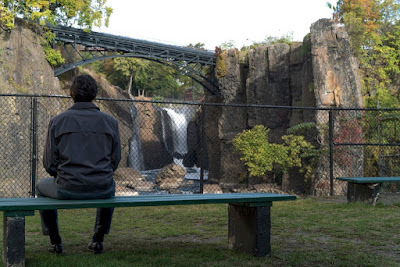 In “Paterson”, Jarmusch re-claims the everyday by honing in on its innate lyricism, and allowing that lyricism to quietly lift up his main character. Paterson lives in Paterson (New Jersey), where he drives a bus Monday through Friday, moonlighting as a poet, heavily inspired, it seems, by William Carlos Williams, who composed five volume poem published over 12 years titled Paterson. These are not coincidences, of course, but the circular rhythms of life, glimpsed just as acutely in Paterson’s nightly walk with his English Bulldog Marvin, in the shape of the Cheerios Paterson favors for breakfast, even in the designs his wife dreams up for new curtains or wears on her dresses. In the protagonist’s rigid routine, which we follow along with for a period of one week, Jarmusch allows a kind of cinematic poem, written in seven stanzas to emerge, as ennui becomes emotional sustenance and artistic fuel for life. Adam Driver evokes an almost preternatural placidity, in the way he sits, in the way he talks, in the way he drives the bus. Even when his character momentarily is enlisted as a hero, of sorts, he remains rather unruffled. He just sort of allows Paterson to exist in the spaces between everyone else, as they, and everything around them, become his objects of study. At the corner bar, Jarmusch’s camera looks on as Paterson looks over the room, as if filing everything away. At his kitchen counter, one moment finds him closely studying the shape of his wife’s homemade drapes. Nothing gets past him. On the bus, where he overhears passenger conversation, Driver has Paterson listen with a small smile, grateful not simply for the material but for the way in which these conversations are small talk about something. have a beer at the bar. That Jarmusch superimposes the poetry over the screen as Paterson scribbles it does not come across as some needless device but an evocation of how Paterson takes what he sees, in the place around him, in his own life, and contextualizes it through his poetry. It’s not a hobby or even an aspiring profession but a part of him, a running diary in verse. You see this idea acutely in a brief encounter Paterson has at a laundromat, where a nameless man, played by the rapper Method Man, is washing and drying and folding even as he workshops a rap alone. It’s “Paterson” in full – taking something as boring as doing the laundry and wresting poetry from it. “I breathe poetry.” That’s what the Japanese Poet (Masatoshi Nagase) says that sits down on a bench next to Paterson. He has come to Paterson to pay homage to the inspiration for William Carlos Williams. This arrives at a particularly delicate moment for Paterson, when his poetry notebook, for reasons not to be disclosed, goes M.I.A. In these sequences, the politeness exuding from Adam Driver’s performance ever so slightly teeters. And when the Japanese Poet asks Paterson if he is a poet, Paterson says no, citing his job as a bus driver. But the Japanese Poet can sense better, gifting Paterson a new notebook. This, like everything else, is not a coincidence but part and parcel to the annular shape of “Paterson” and, by extension. life itself, allowing Paterson’s circle to remain unbroken. He puts pen to paper and starts to write.